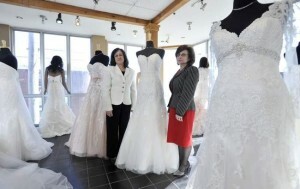 Chantilly’s Bridal is a full-service bridal boutique. What does that mean to you? A lot less stress! Preparing for your wedding should be an enjoyable experience. That’s why we feature everything that is needed for your important day. We have the largest selection of bridal gowns and attendants. Most of our designers are exclusive to our store on the Cape. We also carry large selection of shoes (children’s to adult’s sizes) and purses for that special occasion.